Daunted by the high cost of the state teachers pension system, charter schools are switching to 401(k)-style plans, forcing longtime teachers to decide if they’re willing to accept a smaller, less-certain retirement package or if they’ll change schools to keep their pension. The dilemma stems from a $10.8 billion unfunded liability at the Teachers Retirement System of Louisiana, part of a larger debt at the state’s pension systems resulting from risky investments, erroneous market predictions and a history of inadequate contributions. To make up the debt, current employers, including charter schools, have to pay more — substantially more than they would pay into a 403(b) plan, which operates like a 401(k). For every dollar that a school puts into the retirement system, a quarter goes to a current teacher’s pension. The rest is put toward that $10.8 billion shortfall. Some say the pension system has become prohibitively expensive. 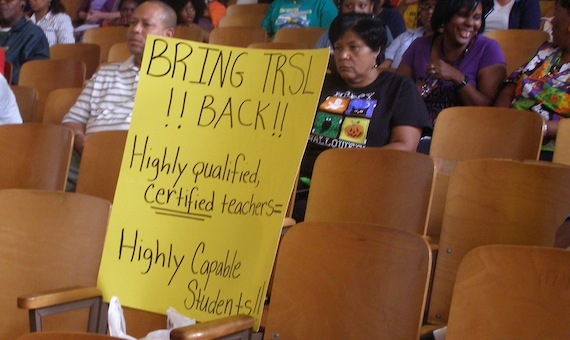 Most of the charter schools in Orleans Parish—47 of 73—don’t participate in the state system. Complicating the matter is a pair of government actions that cast doubt on whether charter schools are allowed to drop out of the pension system and whether they should be part of it at all. Charter schools’ withdrawal from the pension program poses a problem for veteran teachers: If their school drops out of the state’s pension plan, they could end up with far less money in old age than they’ve counted on. The difference could be large enough to convince some teachers to switch to schools that stay enrolled. To see how the shift away from the plan would affect teachers, take a teacher with 10 years invested. Now 55, this teacher—let’s call him Mike—hopes to retire at 65 with 20 years of service. He earns about $46,000 a year now, and he figures in 10 years he’ll make just over $60,000 a year, based on the raises he’s seen so far. State retirement officials say they will calculate his pension—estimated at $2,500 a month for life— based on his three highest-grossing years. One is to cash out his contributions to the system so far – close to $34,000 – and put that money into the 403(b) plan that his charter school offers instead. A 403(b) works the same as a 401(k), but it’s available to public schools and nonprofits. The alternative is to leave the money in the state system, become an inactive member, and start contributing to a 403(b) plan too. If he chooses the first option, he would have to invest that $34,000 and contribute more each month in an effort to match the $2,500 monthly pension check he would have gotten. Even if his investments performed well, the money could run out if he lived longer than expected. If he chooses the second, he’d have to invest his monthly contributions wisely enough to provide monthly income of $1,540 to supplement the state’s $960 check. Though he would need to build up less money in his 403(b) account, he’d be at a disadvantage because he’s starting from zero. In both cases, there’s no guarantee that Mike will end up with a retirement income close to what he would’ve gotten if he had stayed in the state pension system. That will depend on his investment strategy and the market’s performance. What’s more, federal tax laws mandate that because Mike didn’t pay into Social Security when he was enrolled in the state’s pension plan, he’ll probably get a reduced Social Security benefit. Mike’s case is hypothetical, but representative. For Patricia Mims, a 20-year veteran teacher now at Benjamin Banneker Elementary School, the implications are all too real. She’s not interested in moving to any sort of 403(b) plan, and she balked when her former employer, the Algiers Charter School Association, announced last year that it was considering such a move. “Based on the information that was given to me, I don’t think it would have been beneficial to leave,” she said. The state pension system is a “for sure” option for teachers, she said, and though she recognized that it costs schools more, she argued that forcing teachers to drop out is a betrayal of what they’ve been promised. Lusher Charter School will spend nearly $2 million on retirement costs, or 13 percent of expenses, this school year. For the 2011-2012 school year, the Algiers Charter School Association, which manages Mims’ former school Eisenhower and seven others, spent $6.8 million on pension benefits, or about 12 percent of total expenses. The four-school New Beginnings Network will spend $1.9 million on pensions this school year. That’s 11 percent of expenses. And the schools’ required contribution has gone up in recent years. In the 2009-2010 year, they had to contribute 15 percent of their TRSL-eligible payroll, not the 24.5 percent they have to put in now. Those hikes are a trend among the four largest state retirement systems, as they attempt to plug a $18.5 billion hole. The normal cost of covering retirement benefits for teachers is only about 6 percent of payroll. But it costs another 19 percent of payroll to cover the $10.8 billion funding shortfall at the Teachers Retirement System of Louisiana. And if schools pull out of the state program, the state pension system is going to have to squeeze remaining participants more to plug that gap. The state pension systems are “pricing organizations out of the market,” said Vera Triplett, executive director for transition at the Recovery School District and the manager over New Beginnings last school year. “Ultimately once you have to start choosing between paying into [statewide retirement] and instructional items for your school it becomes a no-brainer,” she said. Schools will always pay for computers and books for students before teachers’ retirement, she said. For the 2011-2012 school year, it cost KIPP $436,000 to contribute to employees’ 403(b) plan, Bertsch estimated. That’s 1.5 percent of its total expenses. Had the school enrolled in the Teachers Retirement System that year, it would have paid the system about $3.7 million, or 13 percent of its expenses. The state plan is also less portable than 403(b) plans, Bertsch said. Teachers can’t always take their nest egg with them if, in the course of their careers, they leave Louisiana to work elsewhere. Lauren Godo, a second-year teacher at International High School of New Orleans, is a fan of her 403(b) plan, which lets her choose how much to save for retirement. She’s still “drowning in debt” from college loans, she said, and a pension plan that gobbles 8 percent of her pay is less appealing than saving less in a 403(b). Mims, however, began her career in the pre-Katrina era when virtually all schools were run directly by the Orleans Parish School Board and, by law, participated in the state pension plan. The local school board and the Recovery School District, which took over most New Orleans schools after the hurricane, still participate in the pension program. But those schools are in the minority. More than 80 percent of Orleans Parish schools are chartered now, and state law gives them the leeway to opt out of the pension system. So far, 47 of them have done so, according to state pension officials. That leaves 26 charters still enrolled. Caroline Roemer Shirley, who heads the Louisiana Association of Public Charter Schools, said that pensions seem antiquated in a city where most schools are independently run. Now, schools in New Orleans choose from those longtime, local teachers as well as recruitment programs like Teach for America and Teach NOLA, which attract less-experienced teachers from around the country. Organizations like Teach For America require participants to make a teaching commitment for two years upon completion of the training program. Because these teachers may not make a career of teaching, they could see little benefit in a state pension program. State system officials dispute that its pension-based approach to retirement is outdated. Retirement system general counsel Katherine Whitney said that pensions offer reliable retirement security to many people, and that their plans do offer some portability. As long as teachers stay in public employment, even if they choose to leave teaching profession, their retirement savings follow them, she said. The state pension system also allows people with credit in other state retirement systems to transfer that to Louisiana, and while she can’t speak for every state’s retirement plan, there are “other laws around the country that allow [teachers] to utilize the services they’ve earned” if they are moving from Louisiana to another state. Competing actions by state attorney general, the Legislature and the IRS cast even more uncertainty upon teachers’ retirement finances. But a pending change in IRS rules may force charters to leave the state pension system, trumping both the attorney general’s opinion and the new legislation. The federal tax agency announced in November 2011 that it was revising its definition of a governmental entity, which would impact who could participate in a governmental pension plan. Under the proposed regulations, all individuals who benefit from a state retirement system would have to be employed by a governmental entity, such as the state, an elected school board or the federal government. Though the law considers charters to be independently run public schools, their governing boards are not “publicly nominated and elected,” nor do they have taxation power. That excludes them from the IRS’ definition of a governmental entity and would seem to make their employees ineligible to participate in the state pension plan. The majority of Louisiana charters enrolled in the state retirement plan are in New Orleans. Thirty-two schools were enrolled as of June 2011; now that’s down to 26. If the IRS rules had gone into effect last year, the system would have lost at least $21 million, about 2 percent of its revenue. That’s just counting the loss of New Orleans charters. The proposed rules would affect more than 90 percent of the country’s charter school workforce, according to the National Alliance for Public Charter Schools. This spring, state lawmakers tried to address the issues the attorney general raised by changing charter-school law. If the IRS agrees, these provisions would allow charter school teachers already vested in the state pension system to remain a part of it, if they choose. With all of this legal maneuvering contingent on the eventual IRS ruling, charter schools have taken different approaches to the retirement issue. Fierce opposition from faculty and staff halted a move by the Algiers Charter School Association to abandon the state plan in favor of a 403(b) plan. Friends of King, which runs Dr. Martin Luther King Charter School for Science and Technology and Joseph Craig Charter Elementary School, voted in September to do just that. Friends of King is waiting on approval from the state Board of Elementary and Secondary Education before moving forward. Others, such as Lusher, are weighing the pros and cons of continuing in such an expensive system. Some of their teachers seem to favor the 403(b) option both because of its lower cost and its portability, Lusher school officials have said. She said benefits were a major factor in her decision to move from Dwight Eisenhower to the RSD-run Benjamin Banneker, which is likely to stay in the pension system.“I wouldn’t go to someplace that’s not going to give me those benefits,” she said. “I know the retirement systems are in trouble … and I don’t know how to fix that. *The Lens used state salary schedules for teachers with bachelor degrees in Orleans Parish, and Teachers Retirement System of Louisiana benefit estimates, to create this example. It assumes that the teacher is under the retirement system’s regular plan. Correction: This story originally misstated the number of Orleans Parish charter schools that don’t participate in the state pension system, as well as the total number of charter schools in the parish. The errors have been corrected. More than 300 members of the Algiers community gathered at the McDonogh 32 Literacy Charter School to speak out against recent firings and the transfer of successful principals to failing schools within the charter organization. A call and response chant of “Raza must go” and “erase the board” came following the end of an unofficial public comment section and disrupted the regularly scheduled Algiers Charter School Association board meeting Thursday, June 28.